The best robotic team award was bagged by a group composed of three Electronics and Communications Engineering (ECE) students of the University of San Jose-Recoletos (USJ-R) during the Interscholastic Robotics Competition for college students. This robot by the Josenian ECE team is primarily made-up of recycled materials. It was composed of Philip Bryan T. Dumoran, Sam Kervy J. Pacaldo, and John Jenson L. Villamor. Their coaches were Engr. Cristina D. Sebial and Engr. Anthony N. Jagures. The competition was held last October 20 at SM City Cebu Events Center. 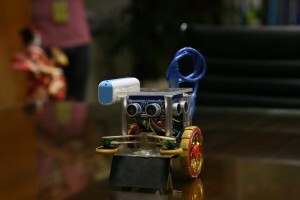 It was the first robotics tilt hosted by the Institute of Electronics Engineers of the Philippines (IEcEP) Cebu Chapter. The challenge poised was for the teams to make robots which can move along a maze. Seven universities from all over the Visayas participated. Only the Josenian group completed the course in a span of 19 minutes. This sealed their win. The team from the University of San Carlos ranked second and the Cebu Institute of Technology-University team ranked third.